The formula contains beneficial ingredients that are known to reduce the impact of aggressors on the skin and repair skin discoloration. 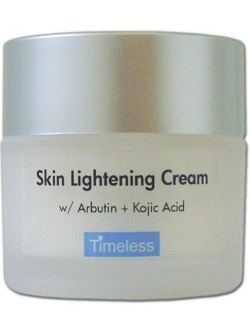 Timeless Skin Care Skin Lightening Cream is a product designed to lighten dark spots. The manufacturer claims that it provides superior results to harsh and irritating peels, powders, and hydroquinone creams. They argue that it gets to the root of the problem for increased results. In this review of Timeless Skin Care Skin Lightening Cream, we have analyzed factors about this product to determine if it can live up to these claims. This will help you make an informed decision when looking for the optimal skin lightening product. The formula contains a long list of ingredients. We have stated a few of them below as the manufacturer does not indicate which of the ingredients are active or inactive. Kojic Acid is commonly used for its ability to reduce hyperpigmentation. The ingredient limits melanin production which can lead to the condition. Licorice Root has anti-inflammatory properties and prevents swelling, redness, and irritation. Isopropyl Palmitate is an emollient that softens and conditions the skin. Tocopheryl Acetate supplies Vitamin E which is an essential antioxidant for skin health. Hyaluronic Acid is used in many skin care products because of its ability to promote collagen production – which plumpens the skin. Squalane works to increase elasticity and retain moisture. The fact that the manufacturer does not indicate the active and inactive ingredients is concerning as we cannot accurately determine which ingredients are playing a role in delivering the product’s intended results. Furthermore, the lack of any patented ingredients renders this formula inferior to products that do contain quality patented ingredients. This product does not appear to be cGMP certified. This is worrisome as these certificates are an indication that quality production processes have been followed. The quality of this product is, therefore, questionable. The manufacturer states that users should apply this product to cleansed skin in the morning and evening. The recommend using sunscreen over and above this product and warn that it is for external use only. The fact that they do not provide the concentrations of the ingredients is concerning as the strength of the product cannot be gauged. This product is currently unavailable on the manufacturer’s online store but will retail for $21.95 when stock arrives. A tub of this product contains 1.7 oz. of product. This is a reasonable price, however, is likely due to the fact that the formula lacks important patented ingredients found in competitor products on the market. Furthermore, there are no bulk-buy deals to ensure that long-term use is sustainable. The manufacturer offers a 30-day return policy. Products that have not been used are eligible for a refund. While this supports faulty deliveries, this does not cover customers who are unhappy with the product results. The lack of guarantee for partially used products suggests that the manufacturer is not certain that their product will work. This brings product effectiveness into question. Another major concern is that there are not enough customer reviews that support the product quality. This may suggest that it is an unpopular option on the market or that it does not work as intended. Either way, there are more proven alternatives supported by positive reviews. The formula contains beneficial ingredients that are known to reduce the impact of aggressors on the skin and repair skin discoloration. The fact that purchases are supported by a guarantee is positive to note. However, the guarantee does not apply to used products. This brings the manufacturer’s confidence into question. Also, there are too few customer reviews to support this product. Finally, the lack of patented ingredients renders this formula inferior to competitor products on the market. We recommend purchasing an alternative skin lightening product.